The Classic Theme Restorer (Customize UI) for Firefox web browsers will restore the classic look and feel of Firefox 29 or earlier. This add-on restores squared tabs, the application button with application menu (known from Firefox for Windows), the add-on bar, bookmarks/history menu/sidebar buttons and other buttons. It moves star &amp; feed buttons into location bar, adds status bar element to the ui and allows many items to be movable. All features are fully optional. Some buttons have to be moved to toolbars manually using browsers 'customizing' mode. Default 'curved tabs' can be optionally replaced with classic 'squared tabs'. Tabs on MacOSX look more like Windows tabs with MacOSX colors on purpose. All tabs are curved and use colours known from squared tabs. Simulates 'tabs.onTop=false' setting and moves tabs below navigation toolbar. On MacOSX tabs also get a 'reversed appearance'. The titlebar button is fixed on titlebars left like on Firefox since version 4.0. It is enabled by default on Windows systems. On toolbars the button appears like a default toolbar button. On titlebar and tabs toolbar the application button can be orange, blue (Aurora), black (Nightly), blue (Palemoon), red, green and gray in normal browsing mode and purple in private browsing mode like on previous Firefox versions. 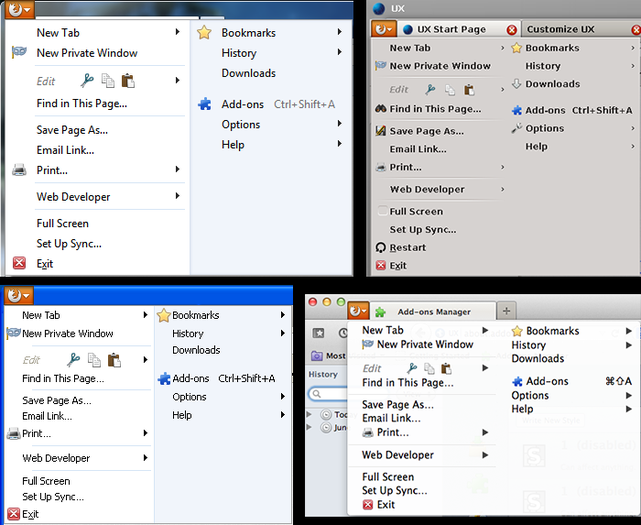 The new appmenu is not an exact copy of the old one, but looks as original as possible. The 'splitmenu' will not be restored and the appmenu popup/submenus also miss some non-replicable menuitems. Navigation toolbar buttons get alternative margins and paddings to simulate old 'small icon view'. Hiding navigation toolbar might be interesting after content got moved to other toolbars. A toolbar at the bottom of the window. All movable buttons and items can be placed on it. Add-on bar can be enabled/disabled using toolbars context menu (right-click on a toolbar) or using 'Ctrl + /' (Windows/Linux) btw. 'Cmd + /' (MacOSX). A toolbar between navigation toolbar and bookmarks toolbar. It can be enabled/disabled using toolbars context menu (right-click on a toolbar). Simulates old icons + text / text modes where text was displayed below toolbar buttons or button icons got hidden. 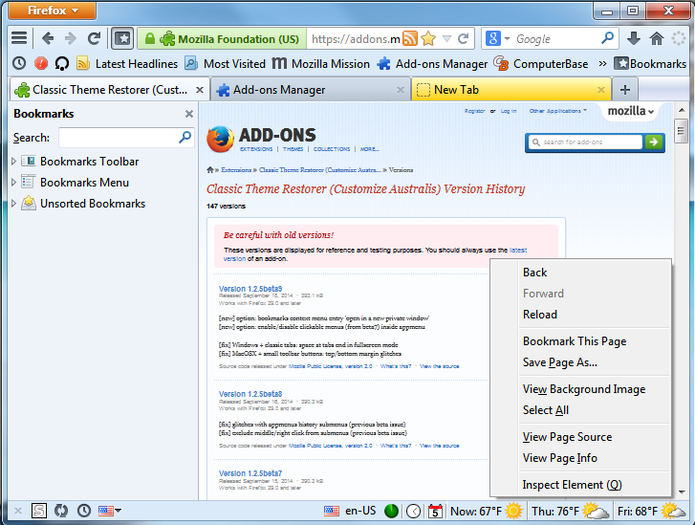 A default 'menu button' which opens the 'classic' bookmarks menu. Positioned on bookmarks toolbar the button also displays its label. Buttons which toggle bookmarks and history sidebar. Browsers default buttons got merged with urlbar and cannot be moved to different toolbar positions or to different toolbars. CTR adds duplicates of these buttons to the customization palette. Place reload button AFTER stop button and enable the corresponding option on CTRs preference window. Hovering the option on preference window to get extra information. 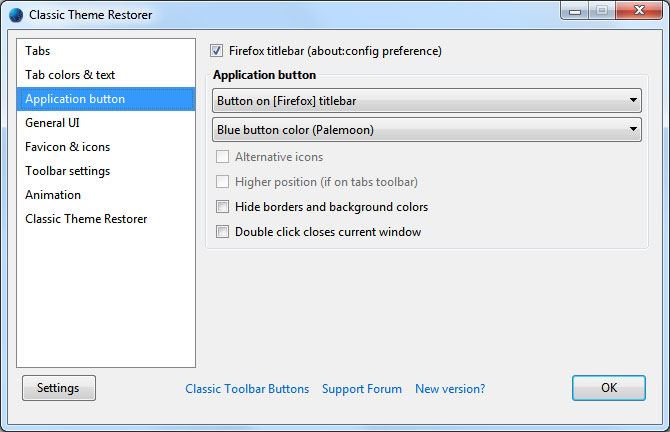 These toolbar items appear in customizing mode and can be moved to toolbars like on previous Firefox versions. This add-on was tested on Windows 7 (AeroBasic, AeroGlass, Classic) &amp; 8(.1) &amp; 10 &amp; XP (Classic, Luna-Blue/Silver/Olive, Zune, Royale), Linux Mint KDE, Ubuntu and MacOSX 10.8/10.9/10.10/10.11. On other Systems or non OS-default themes tab colors may look wrong. Bookmarks, history, stop, reload, back and forward toolbar buttons use default OS icons (Firefox Windows icons on Windows systems, Firefox Mac icons on MacOSX and Firefox Linux icons on Linux systems). 1) Application menus 'cut', 'copy' and 'paste' buttons do not always work like they should. 2) Switching between AeroGlass and AeroBasic on Windows 7/Vista can change application buttons position, if the menubar is disabled. Maximizing/restoring browsers main window or restarting Firefox resolves the problem. This glitch is caused by Microsoft Windows and titlebars behavior and not by this add-on. 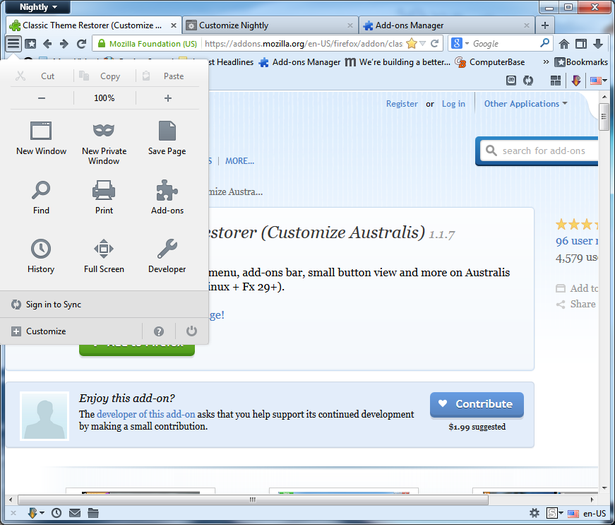 3) Entering and leaving customizing mode 'disables' right-click menu items for bookmarks inside bookmarks menu button. A restart resolves this issue. 4) Tab colors on MacOSX fit to current ui instead of using Firefox 28 colors. This is intended and not a bug. 5) It is strongly recommended to remove Foxtab and Shareaholic before installing Firefox 29 or newer, because both add-ons break Firefox ui in Fx29+. Using Foxtab and/or Shareaholic with CTR causes even more errors, because CTR allows to move/remove more items than the default Firefox does. If one of these add-ons has corrupted the ui, the add-ons manager has to be accessed via menubar (right-click on a toolbar -> select menubar, Tools -> add-ons) and Shareaholic and Foxtab have to be uninstalled and CTR has to be disabled. After a browser restart, CTR can be enabled again. After another restart "restore defaults" in customizing mode has to be hit once. It is recommended to switch to a clean new profile or at least to trigger "Restore Defaults" in customizing mode to avoid UI issues after upgrading from Firefox 28 (and older) to Firefox 29 (and newer). Profile Switcher add-on and Profilist add-on can help creating new profiles. If Avasts "Browser Cleanup" still accidentally removes Firefox add-ons consider removing or disabling "Browser Cleanup" feature. - toolbar context menu &amp; grayed out items "move to menu" and "remove from toolbar"
2,275 8,044 Aris <img src="http://www.oldergeeks.com/downloads/gallery/thumbs/classicthemerestorer143446_th.png"border="0"> Apr 20, 2017 - 11:40 1.6.4 912.6KB XPI , out of 19 Votes.